The CPS All-City Music Program is a district-wide initiative in music. 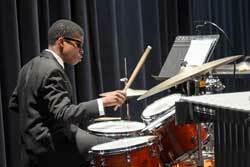 All-City ensembles comprise some of our most dedicated music students and are drawn from our upper schools. Students convene each Wednesday for rehearsals that culminate in winter and spring concerts in the Fitzgerald Theatre at the Cambridge Rindge and Latin School.